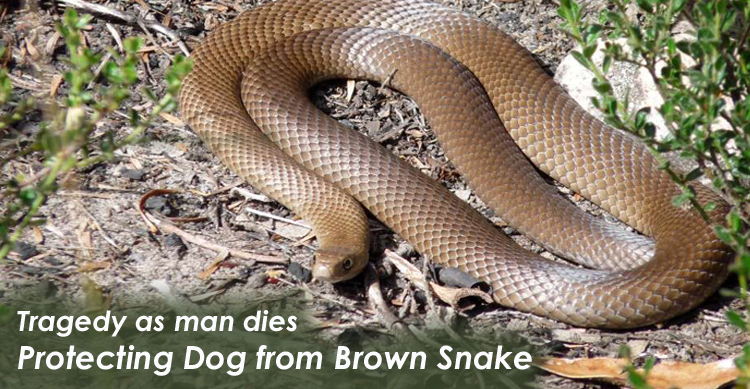 A tragic reminder about pets and snakes as a man loses his life protecting his dog from a brown snake. The 24 year old died in less than an hour after he was bitten in his backyard in north-west New South Wales. Apparently the man went to investigate when he heard his small dog barking in the backyard of his Cole Road home in West Tamworth late on Wednesday night. He found the dog with a small snake in it's mouth and when he separated them was bitten on the finger. It's reported that he woke his mother to tell her and show her the snake which they placed in a coffee jar and took to the hospital for identification purposes. He was given antivenom, but this, and attempts to resuscitate him following his declining condition failed. The man's death has been referred to the coroner. New data from the Univeristy of Melbourne's SnakeMap project found that surprisingly, most reported snakebites in dogs (73%) happened in pet owners’ backyards. "In Melbourne, many pet snakebites happen along the urban fringe in new suburbs, and along waterways such as Skeleton creek in Werribee. In Perth however, it appears snakebites happen in a more scattered pattern across the suburbs'. Snake bite is the most common cause of sudden and violent death in cats and dogs after road trauma and deaths by snakebite are expected to increase with longer and hotter summers expected due to climate change, and a shorter winter hibernation season. The best thing pet owners can do is educate themselves on how to prevent and deal with snakebite. - If you live in the suburbs or semi-rural areas keep your backyard free of rubbish and long grass. - Pet owners should also avoid waking dogs off-lead in long grass or bush, espeically near waterways. - If you do see a snake, don't try to catch or kill the snake. More detail here but “If your pet is vomiting, has red coloured urine or weakness it may have been bitten by a snake whether you have seen a snake or not. Keep your pet as still as you can and take them straight to a vet. The sooner antivenom is given, the better the chances of a full recovery.